Last Spring Hollis found a baby bird in our yard that had fallen from its nest. The poor little thing was brand new, awkwardly flapping its gangly, leather-like limbs and opening its beak in a silent yawp. We collected the baby bird, putting him in a bucket filled with grass. Hollis thought the young bird was hungry, so we tried to feed him sugar water with a medicine syringe. Upon closer examination, T and I discovered that the baby bird's wing was broken and partially ripped from its body. We knew that there was no hope. So, after Hollis reluctantly went to bed, T took care of the bird. But what to say to Hollis? The next morning we told Hollis that the baby bird's mommy and daddy had come for him and they had gone back to live in their tree. We punted. I really hadn't regretted what we did, but now I wish we'd at least broached the topic of death with Hollis. You see, my little kitty, Pandora, is dying. Over the last few weeks she's been losing weight and suddenly stopped eating. While unusual for any cat, it's even more so for Pandy. We affectionately refer to her as our glutton. At one point she weighed nearly 22 pounds, and she's not a big cat. For most of her life she's weighed more than Sir Hillary, our Norwegian Forest cat, one of the largest domestic breeds. Pandy is almost 8. Sir Hillary is almost 12. They're both Aries cats. We got Pandy when Hilly was 4 because he was so incredibly high maintenance. He was an extremely energetic young kitty and developed this annoying habit of trying to sneak up behind us and latch on to our legs to play. Fortunately, he would let out a loud "rooooowwwwr" before attacking, so I could usually manage to fend him off before I got any puncture marks. It wasn't fun at 2 am when I was stumbling to the bathroom. Anyway, Pandy did the trick. Hilly hasn't attacked my legs once since we adopted her as a kitten. We named her Pandora because she really was a Pandora's Box for our spoiled Hilly. He tolerates her, and all the woes of the world that she brought with her. Barely. Pandy is a bit dim, but very sweet and loving. When she was a kitten, she used to crawl up on my shoulder, rest on it like a baby and kneed my hair. If I wore it in a ponytail she got really upset. Even though she's a little big to drape on my shoulder now, she still tries to go for my hair. Pandy is cute in a quirky way. She's black and white, with a black back and white underbelly. Her legs are black and end in white socks. But when you look at the pads of her feet, they are, adorably and surprisingly, black. She has a black face and contrasting white whiskers, with a little white goatee and mustache that stretches up to her nose on one side as if in a lopsided grin. Pandy also has a lot of personality quirks. She overeats (um, that's kind of an understatement) and has been on a diet for most of her life. She spends every night roaming the house and yowling. She's never been very good at cleaning herself, and developed a tacky coat and dry skin over the last 5 years or so, despite grooming by us and Hilly. She's never really liked having the bottom half of her back touched, but now she will bite if anyone other than me touches her there. (And she still snaps at me.) Pandy also hates to be picked up and carried with an arm under her abdomen, my cat carry of choice. Because Pandy hates to be picked up, it took me awhile to notice the weight she'd lost, but I could tell a few weeks ago. Then I started watching her to make sure she was eating. She was eating, but then over the last week or so has stopped and become very subdued. I made an appointment for her with our vet and then one of the cats started peeing in our hallway by the bathroom where their litter box resides. When we saw the vet on Friday, Pandy was remarkably well behaved, but a bit dehydrated. The vet took some blood, gave her some subcutaneous fluids and a Vitamin B shot and sent us home. We got the blood test results back Saturday morning. Her blood levels are very, very bad. It turns out that my poor kitty was peeing in the hall because she was too exhausted to get to the litter box. My kitty "crashed." She's at the animal hospital for the next 3 days while they administer IV fluids and try to get her blood levels back to normal. If it's successful, she'll be on medication and a special food and we'll learn to do subcutaneous fluids at home. Many cats with CRF can be managed and comfortable like this for years. If it doesn't work, we'll have to discuss our "options," which T and I both know means putting Pandy to sleep to prevent further suffering. I'm more than a little upset with our past vets. 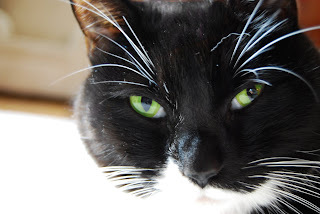 In consulting the internets regarding CRF in cats, all of Pandy's "quirks" are actually symptoms of kidney failure. It's been going on for quite some time. And all of those symptoms are in her charts. We took her to the vet for her annual check-up every year and always mentioned our concerns about her weight and the fur and skin. We assumed it was because she was so large she couldn't adequately clean herself. The vet recommended grooming her ourselves and gave us some fatty acids to add to her food 2 years ago. Four years ago, we even took her to the emergency vet because she was vomiting clear, foamy liquid and we thought she'd eaten something poisonous. They kept her overnight and told us she'd probably eaten something that bothered her tummy, even though Pandy is an indoor cat. We ended up feeding her baby food and rice until she got her appetite back and could hold down food. It's happened many times since then and we've always made jokes about how Pandy must have been hoovering inappropriate things off of the floor again. Anyone want to guess what some of the major symptoms of renal failure are in cats? Yep. 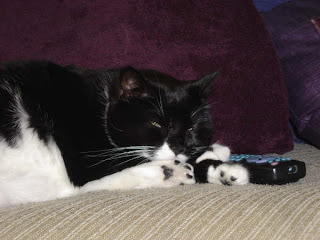 In fact, pretty much all of what we thought were Pandy's quirks, from the overeating and back sensitivity to the dry skin and nightly yowling were actually signs and symptoms of kidney failure. And we had no idea. Four different vets over 5 years and no one ever thought, "Hey, maybe we should take some blood." I guess it's because CRF usually happens in older cats. Pandy is 7, although this problem has clearly been going on for at least 4 years. I got off on a hinsight rant there, but I know my cat. I'm pretty sure she won't be coming home long term, even though I'm trying to block that thought from my mind right now. As upset as I am at losing one of my fur babies, I'm even more upset for Hollis. You see, Hollis has really grown to love his kitties over the last few years. Whenever he's asked if he has a dog, he proudly proclaims, "No, I have two kitties!" He pets them and plays with them and hugs them. He likes to sit with one of the cats on his lap and ask me, "Pandy is my kitty. Right, Mommy?" In the last year he's really begun to understand that Pandy and Hilly are part of our family. We belong to them, just as they belong to us. We take care of them and we love them. Yesterday when I drove Pandy to the animal hospital for her 3 day stay, Hollis repeatedly asked me why Pandy is sick. I've been very careful about what I say because I don't want him to fear that being sick or going to the hospital or doctor will lead to death. I've simply been telling him that Pandy is a very old kitty (even though she's not) and that sometimes very old kitties get sick. When he asks why she has to stay at the vet, I tell him that the vet is going to keep Pandy for a couple of days so she can try to make her feel a little better. Beyond that, I have no idea what to say. If Pandy doesn't get better, I have no idea what I will say. Right now, I'm just hoping that our Pandy will be with us for many years to come. I can't bear to think of the alternative. I'm really sorry about Pandy, S. I hope she manages to pull through and that Hollis gets to love her for many more years. Oh. I wish I knew what to say. I'm really, really sorry to hear this. A sick pet is hard enough even without kids to explain it to. My sister's cat had renal failure. I don't remember how long he lived past diagnosis, but it was a substantial amount of time. She gave him fluids at home, and he went to the vet a fair amount, but he was a happy kitty for a long time. I'm so, so sorry. We got bad news about the dog Friday. It's tough. And I scheduled an appointment with the vet for the cat, who recently manifested the EXACT symptoms your Pandy has. Now I have a direction on Monday. THANK YOU!!!!! I am so sorry you are facing this, though, your precious cat and dealing with the kids. We've BTDT twice already and if you need any ideas...let me know. That is such a hard thing for kids to understand. Why not try to go with the angle of Pandy being so tired she needed to go to a place where she could rest easier.....or maybe that it would make her too sad not to be able to play with him anymore! I really don't know....I hope you don't have to have that conversation! Pandy looks exactly like a cat my grandmother had when I was growing up. I loved that cat so this post makes me hurt even more than it normally would. I'm so sorry. It must be so hard for all of you. I'm SO sorry. Before PunditGirl came on the scene, I had a cat -- Jesse -- who lived a good, long cat life. He was 18. But he had the same issues -- renal failure, IV fluids 2-3 times a week. I know how hard this is. It was one of the hardest times of my life. Hang in there. Im sorry about Pandy. I hope she comes home for a long time. Moe was in renal failure as well...for many, many years. We provided him twice daily insulin shots and provided the special diet. It can be done, and I'm sure you would do whatever you can. It's unfortunate the vet didn't catch it earlier, especially since Pandy was high risk (above avg weight). Eventually we did lose Moe and XBoy was very sad, but it's one of those things they have to be exposed to - death. Some like to explain that God takes care of our pets when they go to heaven. Others are more pragmatic - naturalists - and they become part of the earth around us. It's never easy, discussing death with a child. I had a similar experience with a cat and a vet several years ago. The vet diagnosed my 6 year old siamese with a uninary tract infection and she died three days later. They told me it was because she had Feline Aids but I honestly never felt like they knew what they were talking about and never trusted them again. I'm so sorry you are having to go through this. I'm really sorry about Pandy. It's so hard to lose an animal companion, especially when you have a child who will suffer the loss too. Before becoming an attorney, I was a veterinary technician and saw plenty of cats do just fine with fluids and special food for several years. I hope you all do okay. Oh, sweetie. I don't even know what to say. My prayers are with your kitty. I'm so sorry about your poor cat. I don't even know what to suggest telling your boys if Pandy doesn't pull through. I'm so sorry about Pandy! It should have been caught much, much sooner. When I think of all of the cracks I've made over the past few years (you know the ones), I feel terrible! I will hope for the best. If the worst happens, you will know what to say when the time comes. You know that one of the benefits of having pets is that it helps our children learn about the life cycle. Remember Buffy? You will find the words. And let me know if I can write Hollis about the 'big cat playground in heaven'. Hugs to you all! And, keep an eye on the grouch...errr, I mean Hilly! He will mourn her deeply, I'm sure. Oh, poor kitty. We had a cat with CRF who lived for about three years post-diagnosis. 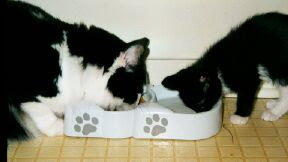 In fact, the other cat (his littermate) died first. Good luck. It is hard to watch, and it is hard to broach with the young ones. Our cat died last March and our older girls were devastated and Jacob (age 5) was upset, but seemed to bounce back within a day - and he loved that cat. I am so very sorry. I hope Pandora is comfortable very soon and that you can find the right words whenever the time comes. Hopefully later rather than sooner. First, I am so sorry about your cat. I can tell how much you love her. Second, when we have trouble broaching difficult topics with our kids, we resort to books on the given topic. Usually, the Berenstain Bears have something... This is a good way to give the child a comfortable way to ask questions. I'm really sorry about your cat. Losing pets is so hard. This pet stuff--it's tough, isn't it? So tough, I wish I could offer some words of advice. And those beautiful brown eyes could just make you weep! Also the beautiful green eyes, too. If that time comes, just speak from your heart and use words Hollis can understand. Dumb it down for him, so to speak. Here's to a miracle for Pandy. Oh. Now I know more. Poor H. This is so sad.